This week, we wanted to let you know about the spectacular spring hiking around us at RiverWalk Resort. 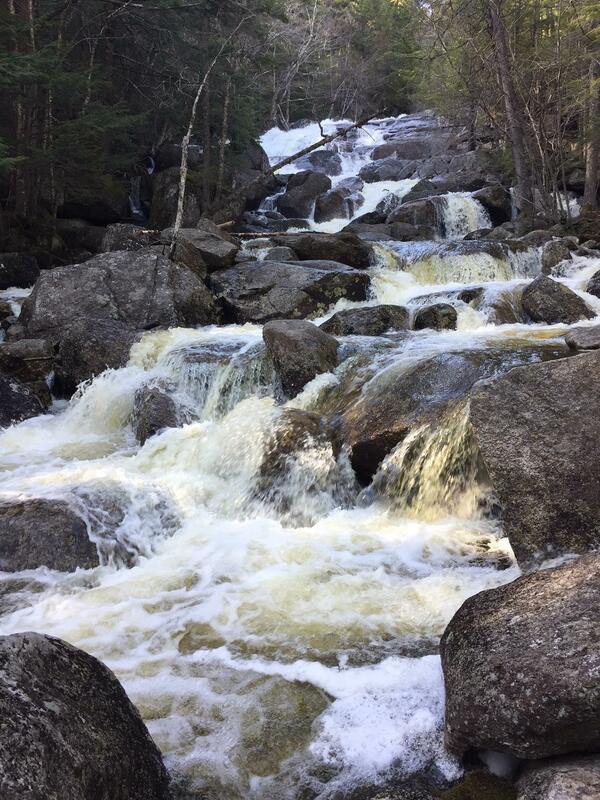 We sent local outdoors enthusiast Christa Peoples on the trail to report back on the status of 5 of the Best Waterfalls to be found in the White Mountains! Read on and check out last week’s post on 10 Must-Do Spring Activities in the White Mountains for some tips on how to vacation like a local. 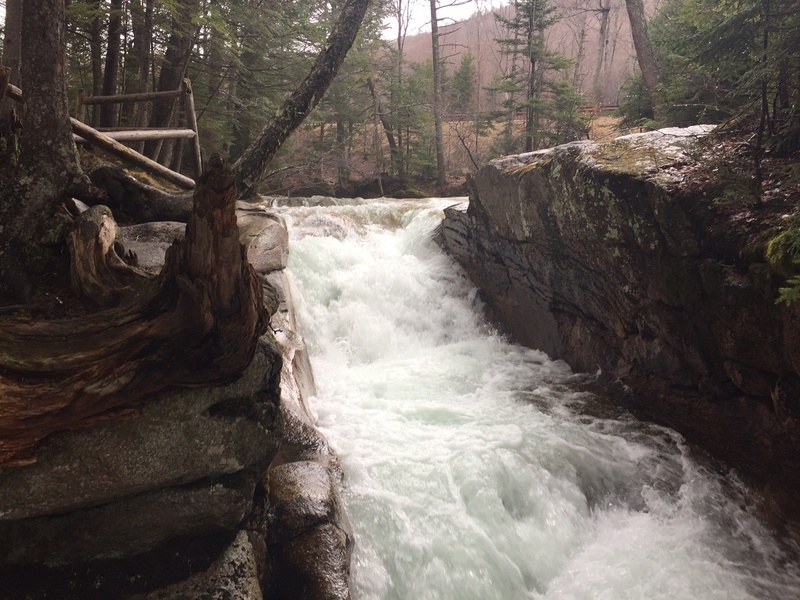 Spring hiking in the White Mountains can be a rugged experience on icy and muddy trails, but the reward is often extraordinary, as cascades and waterfalls – fed by spring rains and melting snow – are at their most impressive. I spent a few days this spring researching and hiking this list of my favorite short hikes to see some of the most incredible waterfalls in the White Mountains. A few things you should know: I tried to pick hikes that would take less than one and a half hours round-trip. I am in decent shape, but by no means am I an Iron Man champion. 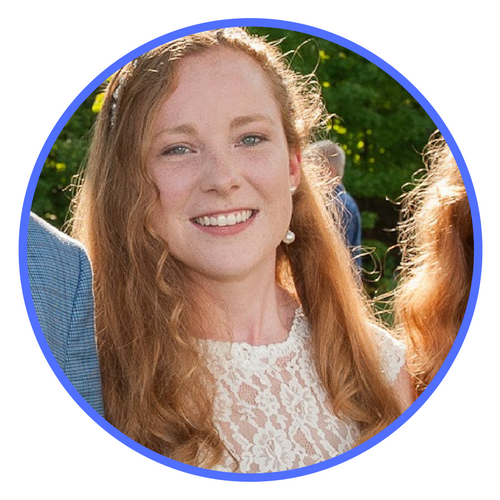 Your time will vary based on your fitness level, the amount of snow on the ground, and the number of breaks you take for photo shoots (you WILL get a new Facebook profile picture out of this, I promise). The most important thing to keep in mind is that spring hiking in the White Mountains can feel a lot like winter hiking somewhere else. 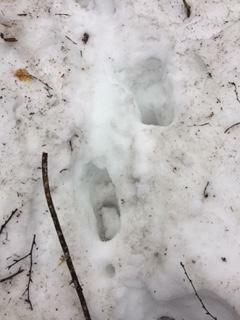 Snow, ice and mud cover the trails, and you’ll see as many rainy, cloudy days as you will sunny. Additionally, although bugs are not an issue in early spring, black fly season hits the White Mountains for about a month every year starting in late May. With that said, grab your boots, rain-jacket, camera, kiddos (someone has to take your picture next to a waterfall), and let’s go hiking! A spring hike to the top of Georgiana Falls in the White Mountains is a dream for photography nerds, fitness enthusiasts and outdoor adventurers who like to explore. A gentle walk that is suitable for most physical abilities takes you to the Lower Falls, while a much more challenging climb with some bouldering required brings you to the top of the 750-foot flume. My total hiking time was one hour thirty minutes. Hey... There’s only one 'n' in “Georgiana.” Something very fishy is going on here. The hike to Georgiana Falls is by no means an easy trek, but the first ten minutes to the Lower Falls is a nice and undemanding walk to warm you up for what is to come. Follow the red blazes painted every few trees. This can be difficult if you are like me, and you watch your feet when you hike (I have to, if I want to stay alive). There is quite a bit of bouldering required about halfway up the falls, and it is very easy to lose the trail. Don’t worry – you can’t really get lost here. Just keep the falls within sight, pick the best path with the easiest footing you can find, and eventually you’ll see another red blaze marking the “official” trail. I went rogue on my way back down – I did a bit of exploring and scrambled down my own path without paying attention to the red blazes marking the trail. Overall, it was a bit frustrating, and the next time I hike Georgiana Falls I will stick to the trail better. Honestly, this hike might not be for everyone. If you aren’t in good physical condition, if you have one or multiple broken bones, if you are deathly afraid of heights, if you are freakishly uncoordinated (like you can’t put on your sunglasses without falling over), if you hate the beautiful and awesome power of nature (what’s it trying to prove, anyway? )… well, this may not be the hike for you. For those who are reasonably confident that they can hike uphill for 45 minutes without ending up in the ER, and for those who want an amazing new Facebook profile picture… Set aside an hour and a half to two hours to go up Georgiana Falls for your next spring hike in the White Mountains. This hike follows the Appalachian Trail along the Beaver Brook Cascades up the first mile of Mount Moosilauke. The walk is not difficult to reach the lower cascades and gets moderately steeper to reach the upper waterfalls. Total hiking time for me was under one hour – and that included photos, a little bit of exploring, and a few slip-and-slides (thank you, spring snow!). Beaver Brook Cascades in the spring - yes, this picture was taken on April 22. The Beaver Brook trailhead is located on Route 112, about seven miles west of North Woodstock. 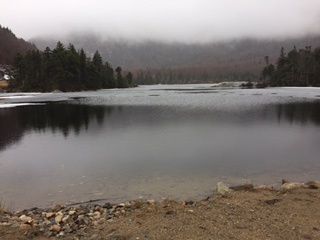 Bring cash for the $3 per-vehicle parking fee assessed by the White Mountain National Forest, and take the path leading to the Beaver Brook Shelter and the summit of Mount Moosilauke. Bonus: You will drive past the entrance to Lost River Gorge & Boulder Caves, a paid attraction with cascades, easy boardwalks and family-friendly caving. Lost River Gorge & Boulder Caves is open mid-May to mid-October. 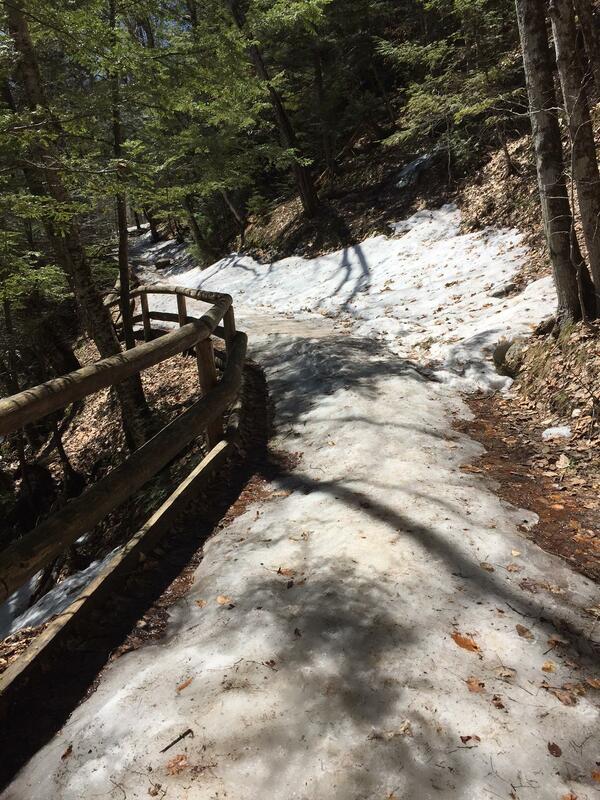 As of the end of April, there is still a fair amount of snow on the ground in the higher elevations. You will definitely want to wear boots and water-resistant outerwear! The climb itself isn’t too difficult, but with melting snow along the pathway, any spring hike will be subject to a certain amount of post holing. Ah, the joys of post holing. You know: that rage-inducing experience when the snow gives out from under your feet, and you get stuck in it up to your knee (sometimes your waist, if you’re short like me). Looks like the Post Hole Monster has been here. Additionally, spring-time is when the water is at its highest due to snowmelt, so the waterfalls are at their most impressive… and you may find the path taking you across knee-deep streams. Now the tough question- nervous tightrope walker or craw-dad style? It took me eight minutes to reach the lower falls (including the time spent deliberating how to cross the above stream), and another ten to my first sight of the upper falls. The lower falls are beautiful and relaxing, but the upper falls are magical. You will see just about every kind of waterfall along this 1,200 foot climb, including plunges, cascades and slides. Almost the entire hike is directly alongside the cascades, so there is plenty to enjoy if you need to stop and take a breath. However, the surrounding granite is covered in moss and very slick, so the waterfalls themselves are not a good place to climb around, especially in the spring. I hope you like this video, because I slipped and fell trying to take it. You may want to keep hiking along this beautiful treasure in the White Mountains; however, I recommend turning around once (or before) you reach the Beaver Brook Shelter. The remainder of the trail goes to the summit of Mount Moosilauke, but it is extremely steep and advisable for experienced hikers only. 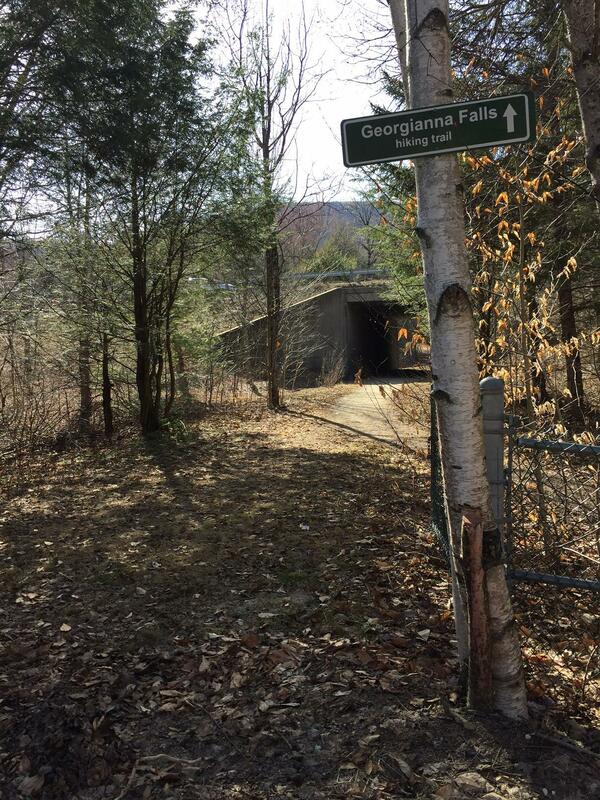 Most prefer to go by way of the Glencliff Trail instead. Bonus: When you’re finished with your hike, drive one parking lot further to have lunch, take pictures, or just enjoy Beaver Brook Pond. I do NOT recommend swimming without a full body wetsuit. 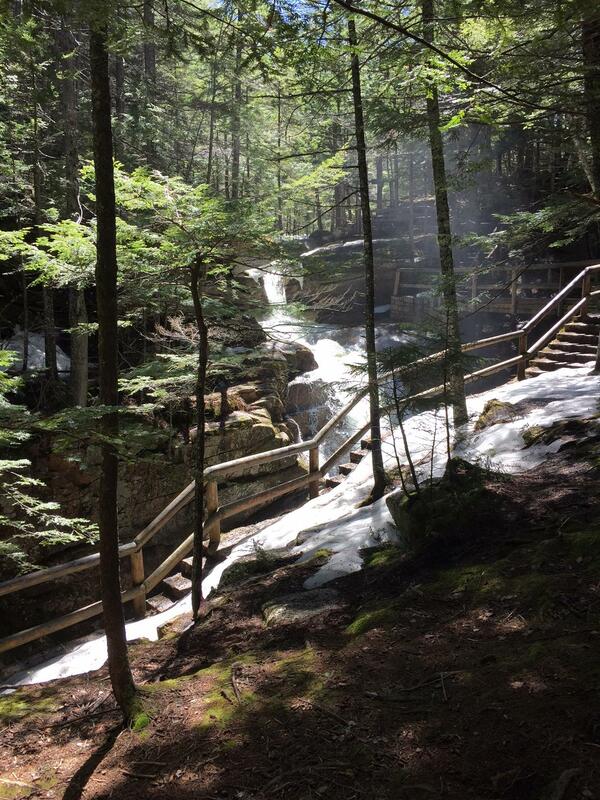 Sabbaday Falls might be the most popular waterfall hike in the White Mountains. It is certainly heavily trafficked, even in springtime. The walk is just over one-half mile round-trip, and the incline is very moderate. A series of stairs and walkways are built right into the cliffside so you can get stunning up-close views and photos of the falls. Total hiking time for me was 30 minutes. Easy parking is available at the trailhead of Sabbaday Falls on the Conway side of the Kancamagus Highway. Bonus: You can take a whole afternoon exploring the trails and overlooks dotting the Kancamagus Highway, a great American Scenic Byway. The Kancamagus Highway, or the “Kanc,” rises just under 3,000 feet through the White Mountain National Forest, and follows several mountain streams flowing into the Pemigewasset River on the Lincoln side and the Saco River on the Conway side. Traffic along the Kanc is not too heavy in early spring. 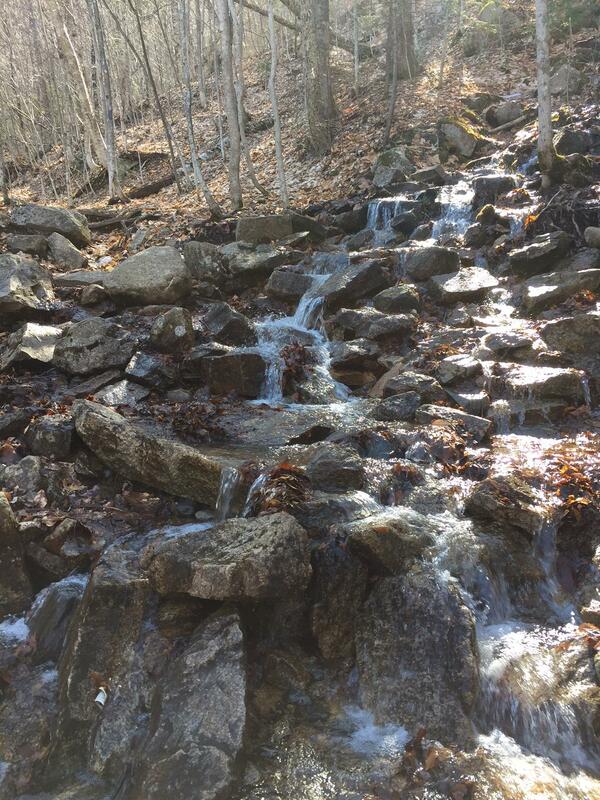 The Sabbaday Falls trail is a beautiful, moderate hike alongside a wide mountain stream. (Although it may look tempting, there is no swimming allowed.) Several benches are mounted on either side of the trail for lovely viewing of the river with your honey. This trail is billed as handicap-accessible, but with the amount of snow and ice along the path, that is not the case in early spring. However, the heavy use has packed down the snow enough that there’s little to no danger of post holing here, hooray! As of the end of April, the boardwalks were closed (under threat of a $200 fine) due to ice on the steps. However, you can still hike up to the overlook at the top of the falls. There are also some nice glimpses of the waterfall through the trees as you head up Sabbaday Trail. This is a great hike for kids, especially a little later in the spring after the snow has melted from the walkways. There is no cell phone service at spots along the Kanc, including Sabbaday Falls. (The horror!) So you may want to have directions to your next stop already queued up on your GPS. Or you could bring an actual map with you…. I think they still make those things. This is a short but steep lesser-known hike to an outstanding 100-foot waterfall. 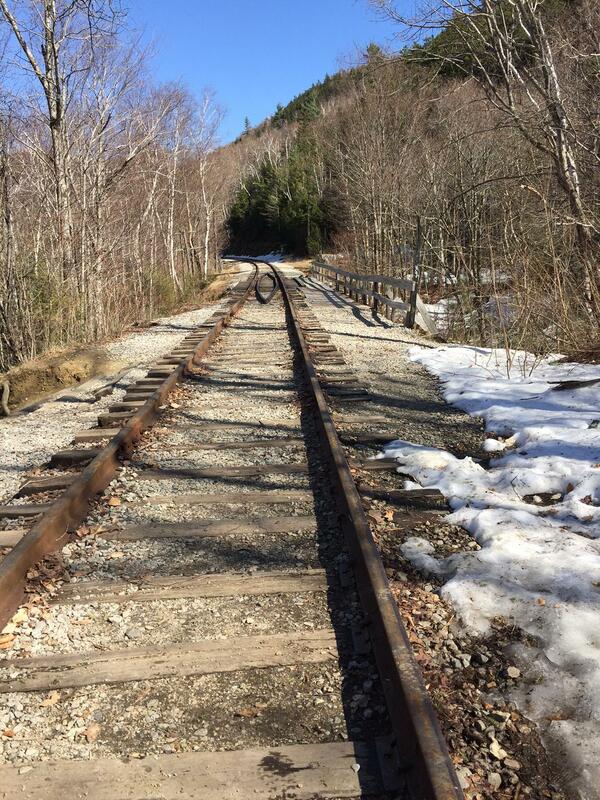 The bottom of the trail crosses the Conway Scenic Railroad tracks, which is quite picturesque. My total hiking time was 45 minutes. The railroad is active, so keep an eye on your kids! The Ripley Falls trailhead is located up a short road on the Twin Mountains/Franconia side of Crawford Notch State Park. The sign is not easily visible from the east (coming from North Conway). The turn is just past an Appalachian Trial crossing sign; if you’ve reached the Willey House Historical Site, you’ve gone too far! I’ll be honest: this one had me wondering if I should throw in the towel and just write about “4 Short Hikes to the Best Waterfalls in the White Mountains.” I didn’t see the entry sign coming from North Conway and had to make a few about-turns before finding the trailhead. Additionally, the hike to Ripley Falls is only 0.6 miles, but it is steep – probably the steepest hike on this list. I’m so glad I stuck it out, because this might just be my favorite waterfall in the White Mountains! The water takes a 100-foot plunge over a 60-degree angle, one of the steepest-angled waterfalls in New England. And in early spring, believe me, it is FLOWING! There is a little bit of bouldering if you want to explore and get some close-up photos. The pools at the bottom of the falls looked like a nice place to take a dip in warmer weather. This trail almost had me fooled that I didn’t need to wear my boots after all. The trailhead is at a much lower elevation than the previous two hikes, and the path started off quite dry, but quickly got muddy and snowy at the end. Plus, this lovely fall crosses the trail, and you’ll drench your little sneakers walking through it. Ripley Falls is located in Hart’s Location, the smallest town in New Hampshire and the first in the nation to vote in the primary and general presidential elections. There is a LOT to unpack about the options located at the Basin exit off I-93 in Franconia Notch. There are several different sights to see along different walkways appropriate for different physical abilities. I went ahead and did all of them. Total time from car and back was one hour forty-five minutes. Bonus: The entrance to the Flume Gorge, a family-friendly 2-mile loop with boardwalks inside the gorge, is one exit south of the Basin. The Flume Gorge is probably the most famous waterfall hike in New England. It is a paid attraction that is open early May to late October. The first formation you will see is the Basin itself, a natural whirlpool accessible by a (probably less-than-) five-minute walk along a paved pathway. This is handicap-accessible in the summer and fall, but in late April, it is covered in ice so uneven and slippery. 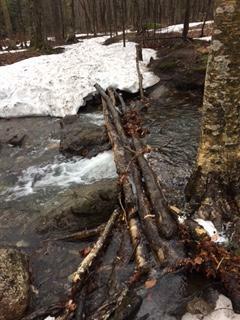 Next there is the Baby Flume, a 6-foot flume waterfall that is reached by way of a short, flat 0.4-mile hike through the woods on the Pemi Trail. The Baby Flume is in the opposite direction of the Basin-Cascades Trail. Look at the cute little Baby Flume! The main attraction here for relatively fit people is Kinsman Falls, a moderately steep 0.5-mile hike alongside wide cascades with stunning views of the Lincoln valley when skies are clear. There are endless places to sit along the cascades, and many hikers will cool off in the stream when the weather is hot. At one spot, there is a very wide tree set across the cascades where you can sit and take pictures (or crawl across, if you’re a dare-devil). These guys kayaked through the stream just below Kinsman Falls. I assume they lived but cannot speak definitively on the subject. When you see the sign marking Kinsman Falls, it is worth it to climb down about 30 feet to reach the pools below the falls for the best visuals. It took me 15 minutes to reach Kinsman Falls from the Basin. Another 0.5 miles up the Basin-Cascades Trail takes you to Rocky Glen Falls, a fine 35-foot waterfall through a narrow gorge. Unfortunately, this is a steep hike on a poorly-marked trail that is extremely muddy in early spring. Muddy like, “Hey, where did my boot go? That’s not cool,” muddy. I spent about 30 minutes picking my way through the mud and looking for the trail before I reached Rocky Glen Falls. Seriously, this hike was RUGGED. As much as it pains me to say it, I do NOT recommend going past Kinsman Falls in the springtime. There are several places to stop and eat lunch or just rest and enjoy being in nature at the Basin exit. A handful of picnic benches are set alongside the stream near the parking areas, and as previously mentioned, there are many flat spots on the cascades to sit and take pictures. A run-down of my votes for 5 Short Hikes to the Best Waterfalls in the White Mountains. 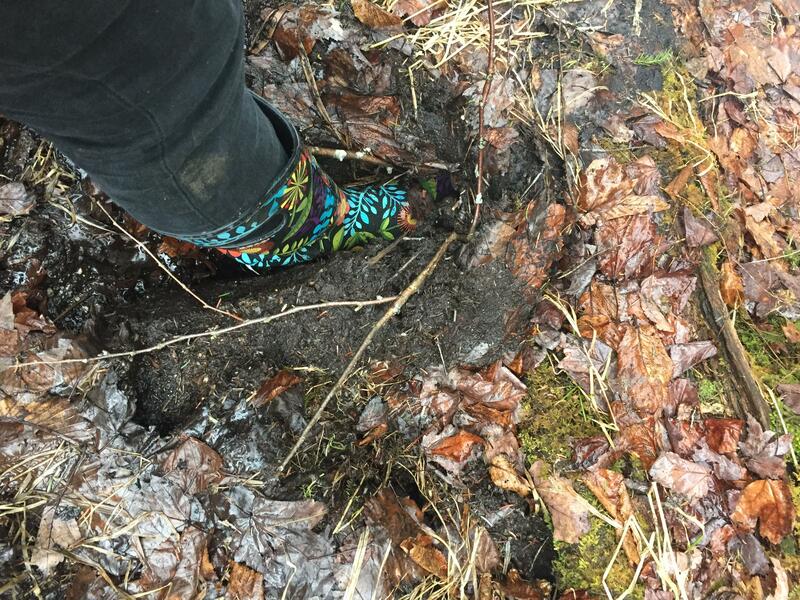 If you are spring hiking, wear your boots, bring a rain jacket, watch out for ice… and HAVE FUN! Report back here and let us know how it goes. 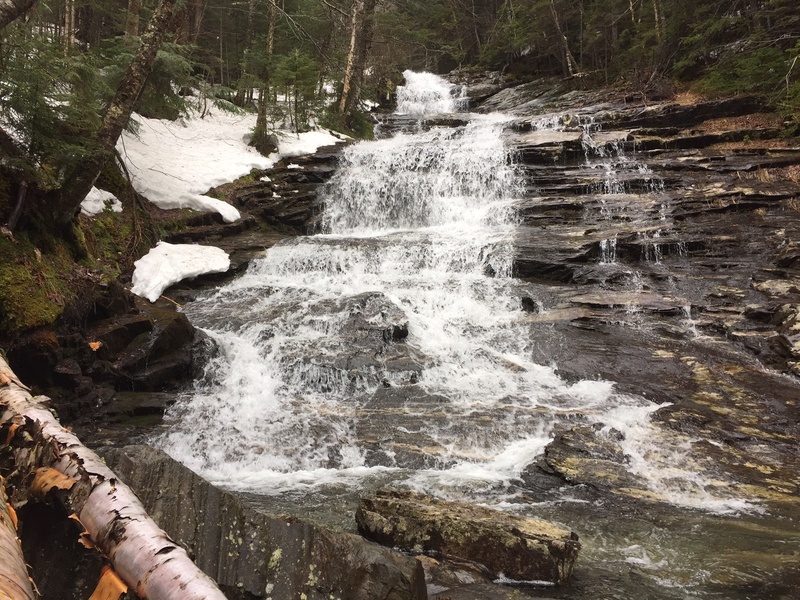 Keep an eye out for the next installment on this topic… 6 Roadside Waterfalls and Cascades in the White Mountains for those who can’t (or don’t want to) hike! Have you hiked on or more of these trails? Did I miss the absolute BEST short hike to a stunning waterfall in the White Mountains? Leave a comment and let me know – I love learning about new hikes to check out!